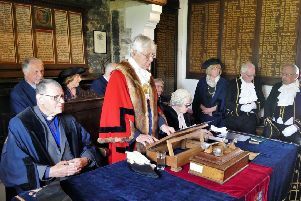 Edes House is one of Chichester’s most recognisable buildings and as well being home to American Declaration of Independence it is a venue with a difference. The Duke and Duchess of Sussex will be visiting the historic building as part of their visit to the county tomorrow (Wednesday). The pair will be there to see the American Declaration of Independence, one of only two ceremonial parchment copies in the world the second is housed in Washington, but there is more to the building that just this. Sheena Campbell visited the building back in 2014 after it was renovated into a venue to discover what it had to offer. Most of us have probably walked past the building in West Street at one point or another, but when it comes to what lies inside, the house is still one of our area’s hidden treasures. Built at the end of the 17th century, Edes House has gone through a variety of uses since being bought by West Sussex County Council in 1916. Beautiful it may be, but its listed status also means the house is expensive to maintain. Kim and Keshira are hoping raising its profile as a destination venue will help preserve it for generations to come. There are five rooms licensed for weddings and civil partnerships at Edes House. The largest rooms available for weddings are The Richmond Room and The Foyer – both holding up to 80 guests. Then there is the Norfolk Room which can host 60, the Leconfield Room, holding 35, or, for a truly intimate setting, the Cowdray Room which holds eight. Each of the different rooms has its own unique style and distinct period features, from the BBB tiles made by William De Morgan in The Foyer to the eggshell blue walls of the Goodwood Room – not yet licensed but my personal favourite. The Richmond Room, with its strong links to the area’s racing history, has sunlight streaming through the windows and houses a grand piano, while the Leconfield has the feel of a more traditional stately home dining room. For events manager Kim Wright, the unique feel of each room is key to the house’s appeal. “For every couple that comes into a room and says ‘I love it’, there is another that will say ‘I don’t like it at all’,” she said. Edes House was built at the end of the 17th century for John Edes, a maltster, and his wife, Hannah. The letters JHE are carved in the pediment above the main entrance. It was apparently nameless until 1841 when it was described as Westgate House in the will of Elizabeth Penfold. The name continued until 1905 when the property was called West Street House, it was changed to Wren’s House by 1911 and in 1967 it was simplified to Wren House. In 1993, it was renamed Edes House in recognition of the fact it is unlikely the house was designed by Sir Christopher Wren. Bought by West Sussex County Council, it was used as its offices until the current county hall was built in 1936. The house was used as the county library headquarters and county and diocesan record offices until the building of the new record offices in 1989 gave the opportunity for it to be restored. Now, it provides a unique venue for weddings and functions alike, as well as still being used as a working council building. The building also hosts a 90 minute tour which starts by looking at the history of Chichester, goes through the history of the building and then ends with the present day. You can feel festive with the Christmas tour where you can see it house decorated for the festive season and enjoy mince pies and refreshments. For more information, visit www.westsussex.gov.uk/edeshouse, or call 01243 777265.